4 The Mohan Singh Case: What Is the Price of Confidentiality? 9 Religious Libel: Are the Courts the Right Place for Faith Disputes? James Richardson, JD, PhD, is Professor of Sociology and Judicial Studies at the University of Nevada in Reno, where he directs the Grant Sawyer Center for Justice Studies, as well as the Judicial Studies graduate degree program for trial judges. His latest books include Regulating Religion: Case Studies from around the Globe (2004) and Saints under Siege: The Texas Raid on the Fundamentalist Latter Day Saints (with Stuart Wright, 2011). He has published over 250 articles and book chapters, and worked on 10 books, mostly on new and minority faiths. 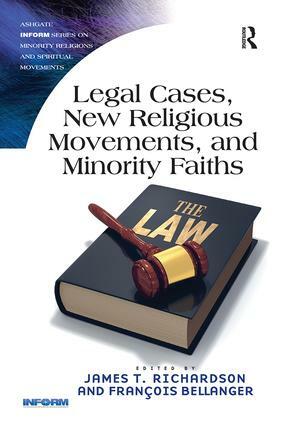 In recent years his focus has been on legal aspects of social control of religions. He is the incoming president of the Society for the Scientific Study of Religion. FranÃ§ois Bellanger, PhD, Professor of Law (University of Geneva), Attorney at Law, has been a legal expert on cults for the Department of Justice of the Canton of Geneva (Switzerland) and is one of the authors of the official report on illegal sectarian practices published in Geneva in 1997 (’Audit sur les dérives sectaires’). He has published several articles on cults and religious freedom. He is the President of the Information Center on Beliefs in Geneva. Inform is an independent charity that collects and disseminates accurate, balanced and up-to-date information about minority religious and spiritual movements. The Routledge Inform Series addresses themes related to new religions, many of which have been the topics of Inform seminars. The series editorial board consists of internationally renowned scholars in the field. Books in the series will attract both an academic and interested general readership, particularly in the areas of Religious Studies, and the Sociology of Religion and Theology.